This is the best dedicated folding rescue knife that I know of. Great for police, firefighters, EMT's, first responders, riggers, search and rescue, and anyone who works with horses or is into boating. 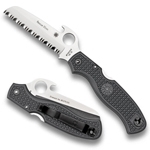 The fully serrated sheep's foot blade is great for cutting all kinds of rope or webbing quickly in an emergency and the sheep's foot blade makes it less likely to injure your self or the victim you are trying to save. 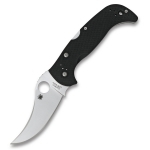 The Spyderco 93mm Rescue is very well made with unlined a FRN handle for light weight, a strong back lock mechanism with a Boye dent and the blade steel is VG10. I really like the Emerson opener (wave) feature, for me nothing is faster to deploy! I also like the fact that that this is a very simple knife with no springs or s an safeties to worry about or fumble with like on an auto or an assisted knife, just pull it out of your pocket and it's open. The only changes I would make to this knife would be to give it a full flat grind, a wire clip and maybe a slightly larger lanyard hole. I would also like a yellow handled Atlantic Salt with the Emerson opener. A full plain edged option would be cool too.